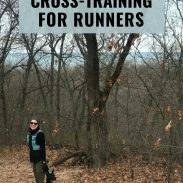 For the injured runner, workout options are limited. Depending upon the nature of your injury, you may not be able to bear any weight on your leg or foot, thus eliminating typical cross-training workouts such as the elliptical or bike. 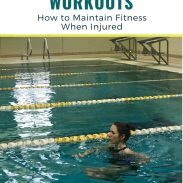 The best option then are swimming workouts for injured runners, which provide the opportunity to develop endurance and maintain fitness while unable to run. Swimming offers everything an injured runner needs: a taxing workout that maintains cardiovascular and musculoskeletal fitness without any impact, thanks to the buoyancy of the water. You work completely different muscles groups than running, especially in your upper body, thus providing an opportunity to strengthen weak areas. Swimming will maintain your fitness throughout injury – there’s absolutely no doubt about that. 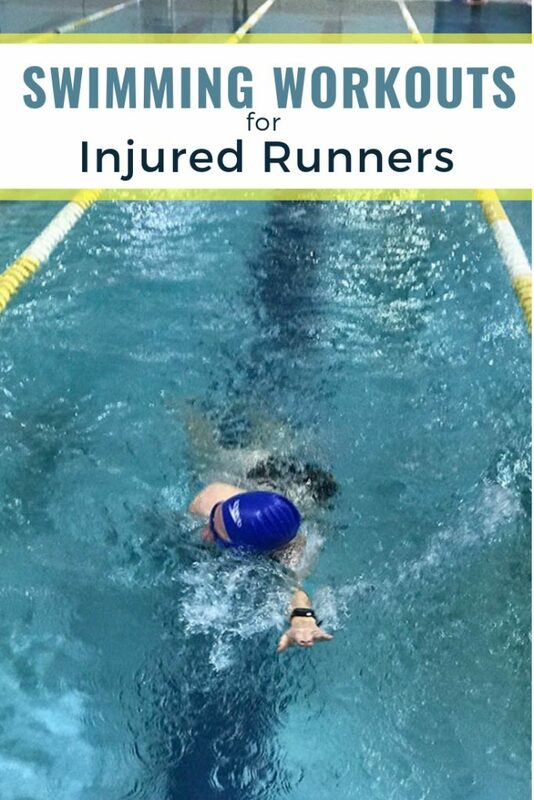 For the injured running, however, swimming can be intimidating – it requires new gear, new skills, and a new frame of reference. If you are like me, you probably did not know how to swim beyond the very basics. You may not have even swam in decades, since childhood swim lessons. This post is not intended to provide swimming advice from the perspective of a skilled swimmer. Rather, this comes from the perspective of an injured runner, nervously entering the pool in hopes of maintaining fitness and sanity during a forced break from running. Watching videos of different swimming strokes on YouTube helped me. (Caveat: Check the comments and source to ensure the video demonstrates proper technique.) Watch the different strokes, try each of them, and find what is most comfortable for you. For runners with high endurance but poor technique or weak upper bodies, alternating strokes allows you to swim for longer before fatiguing. You do not need to do only freestyle for the entire swim, especially if your technique limits you. If the breathing poses a challenge for you, try the backstroke, which allows you to breathe as freely as you need. Personally, I found that alternating freestyle and backstroke worked best for me in the start. Try different strokes and find which stroke or combination of strokes feels the most comfortable for you. Breathing while swimming poses one of the biggest challenges to runners. The technique is different than that of running – in through the mouth, out through the nose, all while coordinating your inhales with strokes and exhaling underwater. If your injury puts you in the pool for the first time in years (or even decades, practice your breathing a few times in the pool before you start swimming. Rotate your head to the side, breathe in deeply, and then rotate your head into the water and slowly exhale through your nose. Holding your breath underwater will limit your endurance, since carbon dioxide builds up if you do not exhale and sends signals to your brain to slow down or stop. Head position aids in breathing properly, especially for the novice swimmer who is nervous about submerging their head. A common mistake is to stare straight down and bring your chin toward your chest, thus restricting airways. Instead, gaze slightly forward and keep your neck straight, thus lifting your head ever so slightly. For your first two or three swims, simple familiarize yourself with the pool and the movement of swimming. Swim for time – such as 20 or 30 minutes – and practice different strokes, altering as often as needed. You will likely find swimming surprisingly tiring – it is a hard workout, especially if your technique is inefficient. Don’t jump into the pool and immediately try to match the exact intensity and duration of what you were running before your injury. Give yourself time to adjust to the unique demands of swimming. Psychologically speaking, many runners thrive within a goal-oriented mindset. That’s why we keep signing up for races and spend months training to shave a few minutes off of our finish time. Injury can be disheartening because it disrupts the process of working toward a goal. Rather than just cross-training without any real intentions during your injury, set a goal. If you are swimming, aim for the goal of completing a certain distance, such as a swimmer’s mile (1650 yd/1500m). Set yourself up with a structured plan, including three or four swims per week, to mimic the structure of a running plan. As longer as you aren’t risking drowning, do not worry if technique isn’t perfect. Overthinking every single aspect of the stroke will likely make you less efficient. Instead, just keep working on your stroke. Think of running: the more miles you log, the more your form refines itself. The same is true with swimming. Your stroke may feel sloppy and your breathing jagged during your first swim. Persevere through those learning experiences; chances are, you will feel more comfortable upon even your third or fourth swim. Depending on the nature of your injury, you may need to take certain precautions in the pool. Runners with stress fractures want to avoid pushing off with their feet against the wall on their turns. For some lower body injuries, you may opt to use a pull buoy for some of your workouts. A pull buoy essentially removes the workload from the lower body, so that you use just your upper body while your legs do not kick as much. And finally, don’t overdo it in the pool! When you are swimming throughout an injury, it is important that you focus on recovery and healing, not solely maintaining fitness. You can swim continuously for every swim, but swimming workouts add variety and structure to your time in the pool. Plus, you will benefit more from including some intensity than swimming at a very slow effort (which quite frankly, is more difficult to do than to run at an easy effort). Unlike running, swimming is so low-impact that you can do a workout for almost every swim. The structure of swimming workouts mirrors those of running interval workouts. You have a warm-up, possibly drills, a main set of work intervals and rest, and a cool down. 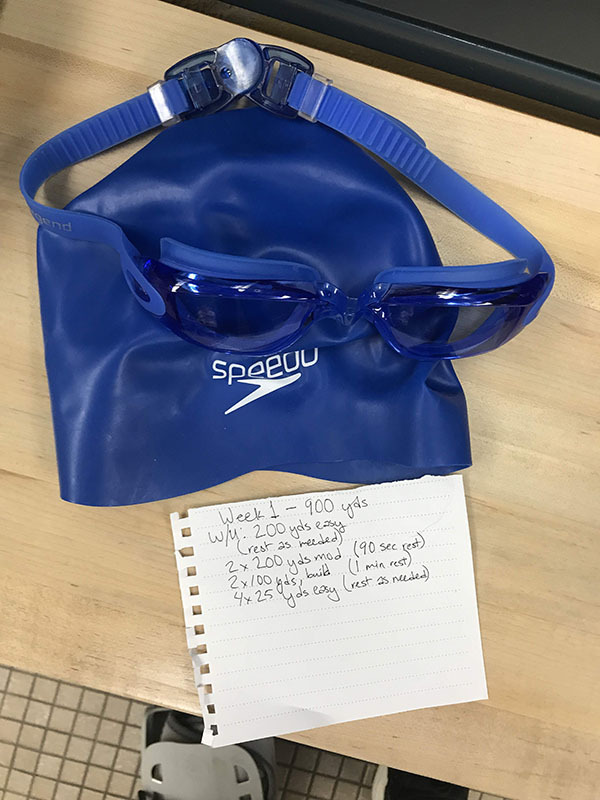 Swim workouts are often written in terms of yards or meters. The difference between the two units is negligible: 1 meter equals 1.09 yards. For most standard size pools, one length measures 25 yards. Repeating 100s: This is a simple, beginner-friendly workout. Repeat 100 yards (4 laps in a standard 25-yd gym pool) with enough break in between to steady your breathing, until you are fatigued. As you progress in the pool, you can add on more repetition and shorten your recovery time. 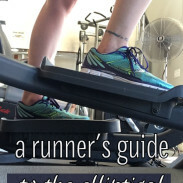 Adapted Fartlek Workout: Take your favorite running workout, estimate the equivalent time spent on the hard intervals, and do it in the pool. For example, after a warm-up (such as 200m easy swim), swim 5-6 repeats of 3 minutes, building intensity with each lap. For the recovery, you can shorten the duration of the recovery interval (say, to 30-60 seconds) and rest completely against the wall. Scale the number of repeats, intensity, and recovery as needed. Ladder Intervals: After a warm-up, swim increasing or decreasing ladders, scaling the duration and recovery intervals to your fitness. For example, you could swim 2 x 200, 2 x 100, 2 x 50, and 2 x 25. Just like running, there’s no magic workout. Aim for consistency, try to accomplish a good workout. Disclaimer: Please always consult your doctor or physical therapist before engaging in any new types of exercise when injured. Do you have a go-to swimming workout? What’s your preferred form of cross-training? I do not like to swim at all. But I love being in the water. So deep water pool running worked for me. Interestingly, my strength coach is also a swimming coach. She’s been trying to get me in the water. I just don’t have the desire. It’s nice to know that I could learn tho.. Swimming is amazing cross training for runners. Water jogging can be super helpful for keeping an injured runner on track for their training. Swimming is low impact but form is critical. In my experience if you aren’t able to do 100 yards in less than 2 minutes a few swim lessons will make your swim workouts much more fun. Swimming is definitely not my gig…for now, at least. I do want to do a tri someday, so there will come a time to just “dive in” and go with it (and some serious lessons LOL). I’m not the best swimmer but being in the pool saved when I’ve had to take time off from running. Deep water running is so different the real thing but it made me feel like I was doing something that resembled it at least. And then when I worked up the courage to actually try doing laps, I found that I kind of liked it. But that doesn’t mean I’m ready to hit the pool all the time now. Just another tool in my tool kit! I am not a swimmer but if I ever take up swimming it will be because I can’t run! I don’t really swim anymore but I used to like to as a kid. nothing fancy with my abilities but when I did swim laps, I recall it being quite a workout!